Whenever Karen and I go back east, we always notice one thing: bricks. Northern California had its fair share of brick buildings until April 18, 1906, when they all fell down. Architects didn't need to learn that lesson twice, so structures made of brick (and stone) are quite rare here, and the few you find are often 19th Century survivors of the Great Quake. Oh, you'll see fake bricks used in facades, but they don't look like the real thing or fool anybody. When we travel, spotting our first brick building is the cue that we're not in the Bay Area anymore. So we were in Toronto gaping at bricks and stones like rubes when we noticed something we hadn't really seen anywhere else: great old buildings with modern steel-and-glass additions butted right up against them. Totally integrated, no gap between them at all, with no attempt made to match their architectural styles. Some of the new work envelopes the old like a gnarled tree trunk grown up around a boulder. I suppose it has something to do with the weather--avoiding the elements while walking from one building to another--but it's an aesthetic decision as well, and an interesting one. Do people protest that the additions clash with or ruin the character of the classics? Or does nobody mind as long as the historic building remains intact? I can imagine locales, including mine, where this approach wouldn't fly at all. Once we noticed it we couldn't stop noticing it, and I started taking pictures because I found it fascinating. I kind of like it. There's an integrity in not trying to trick anybody into thinking the new structure belongs with the old one. Reminds me of how restorers of "The Last Supper" fresco fill in missing paint with watercolor that nobody looking closely would mistake for Leonardo's original work. Herewith, a gallery of "Old and New Buildings Crammed Together in Toronto." If you lived with me, this is what you'd have to put up with. Karen is a saint. Last Wednesday, when our Comics & Medicine traveling roadshow was done but still in town, the Toronto Star newspaper printed a nice half-page article about it. I met reporter Stephanie Findlay but wasn't interviewed for the piece or mentioned in it. However, she used four big panels from Mom's Cancer to illustrate it and gave me credit in the cutline, so my ego was served. Honestly, the article itself, which is available online, is just all right. Ms. Findlay opened by quoting an explanation/definition of graphic medicine by one of our attendees, which is fine as far as it goes but might've been better coming from one of the people who actually organized the event. 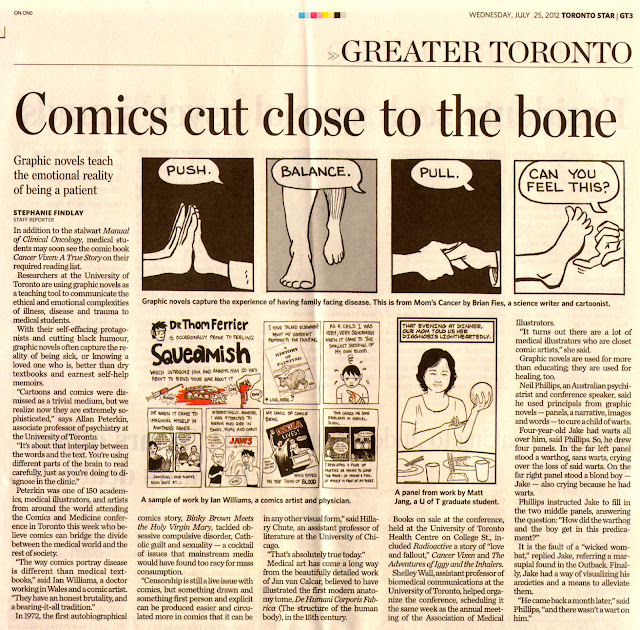 She also devoted five full paragraphs at the end to retelling an anecdote from Neil Phillips, a psychiatrist and lovely man who trekked from Australia for both the Chicago and Toronto conferences, that makes it sound as if comics can cure warts. On the list of the many social, literary and healthcare contributions I think graphic medicine has to offer, I'd place wart-curing way down toward the bottom. We joked that if Neil isn't careful, he'll build a worldwide reputation as The Wart Whisperer. That's fine. As a former and still-occasional journalist, I've met very few article subjects who believe the reporter got it exactly right. While it's not the story I would've written, it's still good press and I appreciate it. Especially those four big panels at the top. Karen and I made it home from Toronto last night, capping our visit with a four-hour-delayed flight we were lucky to get on at all. Oh, Air Canada. The trip, and the Third International Comics & Medicine Conference that was my excuse for the trip, were otherwise spectacular. If I start writing about it, I'll never stop. Nobody wants that. Instead, I'll post and annotate some photos that capture my time in Ontario. Many of the pictures below were taken by Karen. Huge thanks to all who attended and participated. Everyone I've heard from agrees it was a very successful event! The conference was held in the Health Sciences Building of the University of Toronto (beautiful campus). We had several rooms on the first and sixth floors at our disposal, including a large auditorium and lobby on the sixth. At our opening reception Sunday night with one of our keynote speakers, Joyce Brabner, co-author of Our Cancer Year and widow of writer Harvey Pekar. Behind Joyce is our other keynote speaker, Joyce Farmer, creator of the graphic novel Special Exits. This was the Year of the Joyces. Still at the opening night reception. Against the back wall, we displayed copies of a couple dozen pages of comic art done by our conference participants. Turnout exceeded our expectations. The London 2010 conference drew about 75 people, Chicago 2011 drew about 90, and before the Toronto conference we expected maybe 110, optimistically. So I was happy and a bit dismayed to learn that late registrations boosted us to somewhere around 140. Sounds like Momentum. Conference t-shirts for sale at the registration desk, featuring this year's logo by Thom Ferrier, the nom de comics of conference co-organizer Ian Williams. Ian is the physician-cartoonist who spearheaded the first event in London. I packed light because I knew this shirt would be waiting, and counted on wearing it the next two days. I did. Conference registration at the reception. Co-organizer Shelley Wall, who was on the ground in Toronto and did all the legwork pulling the conference together, assembled the best team of volunteers I've ever seen. They were all (I think) grad students who'd actually studied the subject--I had a couple of them talk to me about Mom's Cancer--and staffed every room for every talk, making sure speakers had water, the AV worked, and anything that needed distributing got distributed. They were great. In the background it looks like I just introduced Joyce Brabner to co-organizer Michael Green. I don't think we'd ever throw a conference without Paul Gravett, the British dean of comics criticism and scholarship. Paul gave opening talks in both London and Chicago, and did the same for us again in Toronto. Remarkably, it's always a different talk. Paul has written and edited many books, the latest of which is 1001 Comics You Must Read Before You Die. When I demanded to know why I didn't make the cut, Paul assured me I was #1002. I believe him. The Toronto comic book store The Beguiling set up a table at the conference to sell books by conferees as well as others related to the topic. Owner Peter Birkemoe also hosted a special public event on Monday night after the first day of the conference. More on that later! Two excellent books for sale at the Beguiling table. I'm not necessarily referring to mine. However, both my books did sell out at both the conference table and the Beguiling shop itself, so I was very pleased. Monday morning. We provided conferees with a little breakfast snack on the sixth floor at 8 a.m., with panels and such beginning at 8:30. Security for the Health Sciences Building was computerized so that the elevators didn't operate before 8:00 unless you had the proper card, which none of us did. So I very much enjoyed watching my co-organizers MK Czerwiec and Ian Williams step into a lift at 7:58 a.m. knowing it would take them all the way to the top of the building and then straight back down again without stopping, and I had the camera ready when they stepped out. MK knew what I was up to; I think Ian was just befuddled. After a full Monday of panels and such, we retired to the Beguiling and The Central restaurant/bar next door, which Beguiling owner Peter Birkemoe had arranged for us to take over for a special open-to-the-public interview of Joyce and Joyce by Paul. Unfortunately, as the time for the interview neared, Paul was nowhere to be found. This photo shows me, Peter, Ian, and Joyce Farmer desperately formulating a back-up plan in which I would interview the Joyces, or Ian would interview me plus the Joyces, or goodness knows what else. Luckily, disaster was averted (truly!) because Paul swept into the room and set the world aright again. I treated Ms. Farmer to the carrot cake and coffee she's enjoying, and she and I had quite a while to chat before the event. She is absolutely terrific. Paul doing his usual elegant job interviewing Joyce and Joyce, plucking obscure publications and references from his encyclopedic brain. No notes. Amazing. It was a good conversation, with one of the most powerful moments coming when Ms. Farmer said that she'd had a mastectomy and opened her jacket (not her blouse) to reveal her contours and punctuate the point. A lighter moment came when Ms. Farmer mentioned visiting Oxford, Mississippi. Paul interrupted in his velvet, plummy, Alistair Cooke accent: "There's an Oxford in Mississippi?!" Tuesday morning at my workshop, titled "Cartooning Fundamentals: Mastery of Time and Space." Although I moderated some panels and kept busy, this was my big responsibility for the conference. It seemed to me that an academic event devoted to high-falutin' analysis and discussion of comics should actually dedicate some time to making them. The idea was that in 90 minutes I'd give participants some insights into how comics work and the confidence to create their own comics and help others create theirs. The workshop culminated in participants drawing a comic, which they shared with the group (via the camera in my laptop hooked up to the video projector) and I gently critiqued. I'd made up 30 packets and distributed them all, so a full house. I'd judge it a complete success, not because I think I'm such a great teacher, but because the participants--many of whom didn't consider themselves artists--came up with some really great, funny, touching comic stories. They were good sports and I couldn't have been happier with how the workshop went. We ended the conference Tuesday with a post-mortem where conferees were invited to share what they thought worked, didn't work, and might work better in the future. This is at the start; we were soon joined by Joyce and Joyce, who offered advice of their own. We got some good ideas. The main criticism, as it had been in Chicago: too much good stuff going on at the same time to see it all. 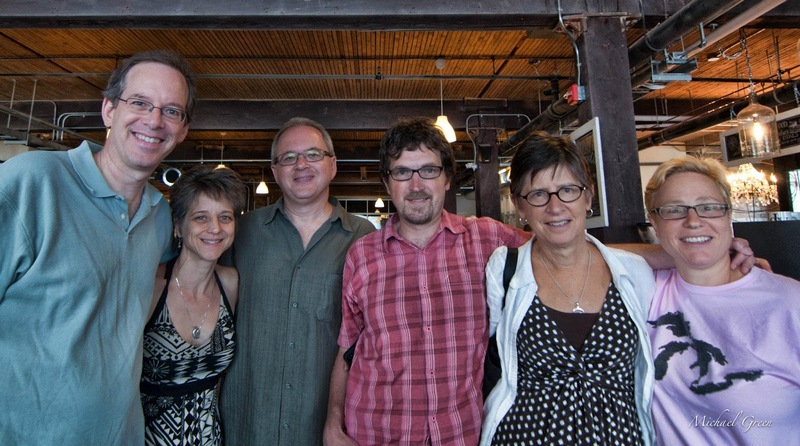 From left to right are organizers Michael Green, Susan Squier, Shelley Wall, Ian Williams, me, and MK Czerwiec. First thing Wednesday morning, the organizers met at Toronto's Centre for Social Innovation to participate in a group interview by journalist Desmond Cole, who attended the entire conference and really seemed excited by the subject. I'll let you know what comes of it; meanwhile, here's an article Desmond wrote about one of our conference speakers. He also loaned us a room where we did some more post-conference analysis and began making plans for the next one (if you're affiliated with a university or similar community institution and want to do a ton of work for no pay, let me know!). Also, after seeing this photo from Michael on Facebook, it occurred to me that we came this close to accidentally arranging ourselves in order of height. This is the only black mark on Shelley's otherwise exemplary performance during the conference. After that, Karen and I played tourist. Toronto is a thoroughly walkable city, and we logged many miles/km seeing the sights. This was a good one. The building at right is the Ontario College of Art and Design, held aloft by angled columns painted and tapered to look like colored pencils. The building at left with the orange awning is the Underground, one of the best art supply stores I've ever been in. Wednesday night was Laydeez Do Comics, which requires some explanation. Laydeez began in 2009 when Nicola Streeten and Sarah Lightman gathered a group of women in the UK to talk about the comics they made. Laydeez quickly grew as a creative forum, social group, and salon that welcomed comics creators (both women and men) to take part and tell their stories. Laydeez have also expanded geographically, from London to Brighton to San Francisco to Toronto, and their meeting Wednesday night was set to coincide with the Comics & Medicine Conference, at which both Nicola and Sarah spoke. And that's where I got together with cartoonist Mike Cope, cartoonist Sandra Bell-Lundy (creator of the syndicated comic strip "Between Friends" and one of the speakers that night), cartoonist/illustrator/author Patricia Storms, and cartoonist Jonathan Mahood (whose comic strip "Bleeker the Rechargeable Dog" is a charmer). 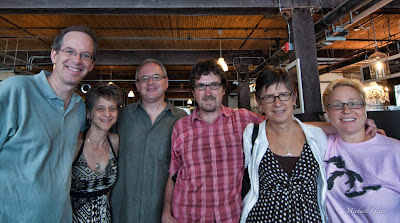 All were Internet pals I'd never met in person before arriving in Toronto. Mike Cope had to introduce himself because I had no idea what he looked like. Patricia and I go way back; she was one of the first pros to reach out to me at the start of Mom's Cancer and was thanked for it in the book's acknowledgments. This was a special treat. On the campus of the University of Toronto. On the Observation Deck of the CN Tower 346 m (1136 feet, approximately 113 stories) above Toronto. A friend from Toronto rolled her eyes when I said we'd been to the tower. "But it's so touristy!" she complained. I long ago got over any embarrassment about being a tourist. That's what I am, why pretend I'm too cool not to be? The tower was worth the visit. Thursday, getting ready to board the Maid of the Mist at Niagara Falls, which is behind us. We rode the train down from Toronto, which took about two hours and we hoped might be scenic. It wasn't. That's all right; the falls more than compensated. And later, from an overlook above Niagara's American Falls (left) and Horseshoe Falls (right). Niagara Falls was also very touristy and very, very worth the visit. It's been impossible to visit it in a pristine natural state for more than a century. I say embrace the kitsch for what it is and let the power of the falls speak for itself. It's pretty loud. Thanks again to the conference participants, the organizers, the volunteers, the Laydeez, and the kind people of Ontario (excepting a few at Air Canada). Nice country you've got there. A mixed bag on the run . . .
Amber the Simple Cat remains unimpressed. I'm getting ready to go to Toronto next week for the Third International Comics & Medicine Conference, the second such I've helped organize. The organizing committee had our final conference call yesterday and convinced ourselves that any remaining problems will be small ones. I'll be moderating a few panels and giving a 90-minute workshop I've titled "Comics Fundamentals: Mastery of Time and Space" because I think too small. I very much like the idea of taking some time at an academic conference dedicated to analyzing, dissecting and bloviating about comics to actually write and draw some. If you attended my workshop at last year's conference in Chicago, this one will be about half new and twice as good. I hope. We'll see. What's the worst that can happen? Great. Now I'll spend the next five days visualizing the worst that can happen. I've never been to Toronto, hear it's a great city and am looking forward to making its acquaintance. Any suggestions for "Don't miss" activities/attractions are very welcome. Allow me to point you to this piece on the blog of master comic book letterer Todd Klein (whom I've met!) about the Golden Age letterer and designer Ira Schnapp. Or, more precisely, stories that artist Neal Adams told Todd Klein about Ira Schnapp. Never heard of any of those guys? Hardly matters; it's still a neat human-interest story about a type of professional pursuing the type of career that I just don't think exists anymore. The many ways Mr. Schnapp and his contemporaries found to practice the art and science of typography astonished me. Everything from logos atop comic-book letters columns to chiseled marble panels atop Grand Central Station. Worth a minute of your day, I think. After pencilling 110-plus pages of "Mystery Project X," I'm seriously thinking about scrapping all that and starting over from scratch with an entirely new plot and graphic style. Same protagonist and premise, but a totally different approach that came to me in the past week and I really love. I need to let it simmer and maybe do some sketches before I pull the trigger (The Wingwalker's Credo: "Don't let go of what you've got until you've got hold of something better"), but I'm not afraid to. What I have in mind will be much more fun for me to draw and for you to read. It's all part of the process of creative destruction. The good news: I can turn over those 110-plus pages and draw new pages on their backs, saving me a ton of money on paper. Win-win! "On To Toronto" isn't a palindrome but it should be. If I don't post again before I go, I promise plenty of stories and pictures when I return. Not What I Had In Mind. ARF! Meet a puppy. Eight weeks old, abandoned at a bus stop, taken to a veterinarian who passed it onto a pet foster parent who passed it onto a co-worker of Karen's. I swear every vet in the county has our phone number on their "Suckers" speed-dial. Breed: mutt, definitely some wire-haired terrier in the mix. Danger: Do not stare directly into the puppy's eyes. Cuteness aside, this may be the smartest, best-tempered dog I've ever encountered. She instinctively fetches and heels: drops the ball right at your feet and trots at your side, no training. Show her something two or three times and she gets it. Sociable but without psycho separation anxiety. I may not have sought a pup but after taking her for a test spin doubted I'd never find another like her, so we figured you've got to accept opportunities as they come. Helping out at the office. In case I need some artwork chewed up or peed on. HERE'S some news out of the San Diego Comic-Con I knew was coming but had to keep quiet until it was announced, which was evidently today: my publisher Abrams has signed an agreement with digital comics distributor ComiXology to carry a select list of Abrams' graphic novels, including my own Mom's Cancer. Here's ComiXology's press release about it. In addition to Mom's Cancer, the other Abrams books getting the digital roll-out are My Friend Dahmer by Derf Backderf, Empire State: A Love Story (or Not) by Jason Shiga, Fairy Tales for Angry Little Girls by Lela Lee, and Cats, Dogs, Men, Women, Ninnies & Clowns: The Lost Art of William Steig by Jeanne Steig with illustrations by William Steig. That's some excellent company to be in! Honestly, I don't really know what to make of this or how big a deal it is. Evidently, people may now read my book "through the power of ComiXology’s patent pending Guided View technology and CMX-HD." I don't know what that means. However, I do know that the ComiXology digital platform works on the iPhone, iPad, Android and Kindle Fire; I like the sound of that. ComiXology has provided more than 75 million downloads of more than 25,000 comics, so there's potential. But most of that total is Marvel and DC books bought by superhero fans--not traditionally my best customers, so who knows? I expect we'll tally somewhere between 1 and 1,000,000 downloads. Basically, I look at it as one more unexplored medium, one more opportunity for Mom's Cancer to reach readers it didn't reach before (also a medium that didn't exist when I created the story!). That's what that book is about. Thanks to the ComiXology folks for taking me on, and to Editor Charlie and the folks at Abrams for making it happen. Both show an impressive amount of faith that I hope my work justifies. Hectic days. Just wanted to take a moment and express my appreciation for those who pop by the Fies Files now and then to see what I'm up to. The answer: too much. My day job is picking up, and will get exponentially busier through year-end. In addition, I'm doing some special projects for my daughter, the USS Hornet Museum staffer. In addition addition, I'm preparing to head to Toronto the week after next for the Third International Comics & Medicine Conference, which I'm helping organize and will give a workshop for. I'd like to draw some new "Adventures of Old Time-Traveling Brian": no idea when I'll be able to. I'd like to draw some new pages for "Mystery Project X": ditto. Forget about "Mystery Project Y." I'll save that one for retirement. The big Comic-Con International (CCI) starts tomorrow night in San Diego. I won't be there. I love the con, it's been very good to me, but getting passes and hotel rooms has become such an expensive hassle--even more than it was three or four years ago, even for a pro--that I've decided there's no reason to go back unless I'm invited to be on a panel or have something to promote. I can get my comics convention jollies at the local WonderCon (assuming it returns to San Francisco after a year in Anaheim; please come back!). I have a lot of comics friends who've concluded the same. CCI has become Yogi Berra's favorite restaurant: "Nobody goes there anymore because it's too crowded." I understand the irony of that complaint since the first year I attended was 2005. Old-timers have been saying the same since at least the '80s. I nevertheless feel a familiar aching itch coming over me. Like I'm missing out on something I should be a part of. Comic-Con is a raucous party by and for 120,000 people who are family, even crazy Uncle Tito and slutty Cousin Vivian. My people. I always met someone I was awed to meet, and invariably walked away with two or three friends I didn't have before. I guess what I'm saying is, if you're going to San Diego this week, have a good time for me. EDITED TO ADD: Forgot to mention! Just because I'm missing San Diego doesn't mean my books are, too! Editor Charlie and the Abrams gang will be in Booth #1216, and according to this here press release they'll be selling copies of the WHTTWOT paperback. Among the books highlighted, I've read My Friend Dahmer and thought it was great (and said so in my review), and saw an early galley of The Carter Family and thought highly of it as well. There'll be an entire panel dedicated to Abrams ComicArts' upcoming releases, and Editor Charlie will appear on five or six other panels besides. If you're at the Con and interested in the paperback (only $14.95! ), it'd mean a lot if you'd buy it at the booth and tell 'em you're a fan. If you are. Don't lie on my account. But it's a big help to me if they hear it directly from you. Does anyone else ever get the inkling that the Internet may just be a big waste of time? Crazy talk, I know, but sometimes I wonder . . .
Our alpha cat, Rose, died yesterday. Sovereign of all she surveyed, twin sister to the late Marbles, she was nearing 17 and died of kidney failure, which seems to be the condition that most often takes down old cats. We administered nightly subcutaneous IVs for about a month (which I report only for the benefit of some I know who've done the same) but on Monday she told us clearly that she was done. We followed her final command and took her to our vet friend, then brought her home and buried her next to her sister. Like all our cats, Rose was an indoor cat, and no doubt lived a healthier, safer, flea-free life because of it. Plus, when Rose did get outside, she tended to run and hide under the deck for the rest of the day. Last week we gave her a "Make A Wish" romp in the backyard. Losing Rose leaves a hole in our household, of course, but mostly I feel bad for my girls. A co-worker of Karen's thought our mirror-image identical twins (one left-handed, one right-handed) needed mirror-image twin kittens, and we agreed. Rose was light-colored on the left side of her face, Marbles on the right. I don't know if Laura and Robin remember a time without them. The cats had very different personalities but were fiercely loyal to my daughters. I'm grateful for that. I'm also grateful that the girls came home the last couple of weekends, knew the prognosis, and had a chance for final snuggles and goodbyes. Marbles and Rose on my belly in 2008. Rose especially had the superpower of instantly drowsing me to nap merely by sitting on my chest. Two minutes later, BAM, I was out. I'll miss that. Our remaining feline, Amber the Simple Cat, seems discombobulated and terrified to eat breakfast because Rose always got first dibs on the communal bowl. We are administering extra ear scritches. They say you're either a cat or dog person; I disagree. I've had and loved both, but it is true that a dog only aims to please while a relationship with a cat happens on their terms. I respect that. When a cat lets you know you're all right, you know you've earned it. Trying to live up to their standard made us better people. I'm grateful for that, too.